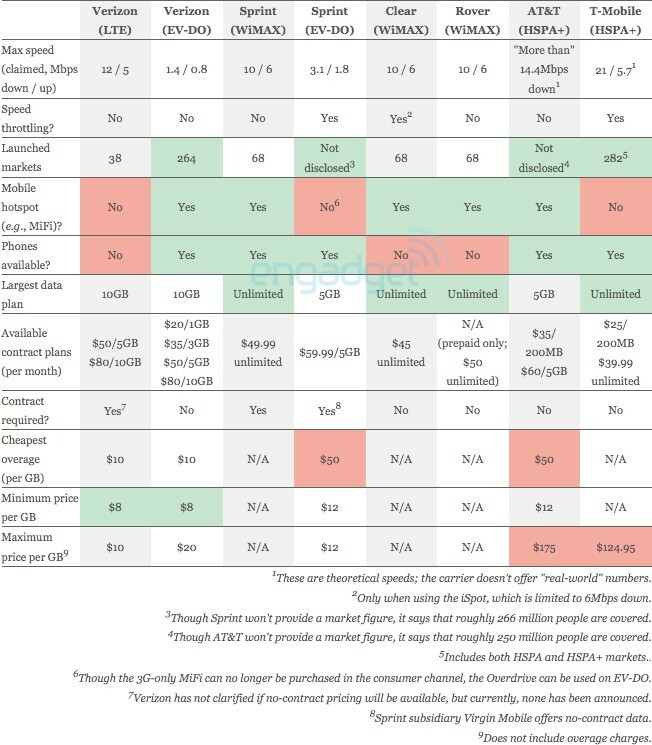 Now that Verizon's gone official with its LTE pricing for an initial launch in some 38 markets this Sunday, we wanted to take a quick look at how it compares to the other players in the laptop data market -- after all, how much you're paying month to month can be just as big of a determining factor (if not a bigger one) in choosing a carrier than the speeds you're seeing. So how do Sprint, T-Mobile, AT&T, Clear, and Rover stack up? Let's break it down. 1These are theoretical speeds; the carrier doesn't offer "real-world" numbers. 2Only when using the iSpot, which is limited to 6Mbps down. 3Though Sprint won't provide a market figure, it says that roughly 266 million people are covered. 4Though AT&T won't provide a market figure, it says that roughly 250 million people are covered. 5Includes both HSPA and HSPA+ markets..
6Though the 3G-only MiFi can no longer be purchased in the consumer channel, the Overdrive can be used on EV-DO. 7Verizon has not clarified if no-contract pricing will be available, but currently, none has been announced. 8Sprint subsidiary Virgin Mobile offers no-contract data. 9Does not include overage charges. Click here for an image of the chart that's viewable on your mobile device. So as you can see, there isn't a clear-cut winner by any stretch of the imagination -- it really depends on what you're looking for -- and considering that Verizon is launching with just two USB sticks (that lack Mac compatibility) in 38 markets total, it'll be a while before they become a mass-market option. More importantly, judging from the disparity in pricing from left to right, it'll be a while yet before data plans stabilize; question is, is 10GB enough of a bucket when your network's capable of delivering real-world, low-latency speeds of 10Mbps? Ross Miller contributed to this report.